access control | multinoDe-2 controllerDAtASheetSymmetryAcceSS controlDAtABASe UnitS2-Dc Door controllerreader technologies & card formatsThe Symmetry multiNODE-2 controllers support a range of readingtechnologies including proximity, smart card and magnetic stripeby direct connection.  A number of default card formats are preprogrammedas standard and there is the capability for customformats to be added. This is particularly important for the morespecialized application. 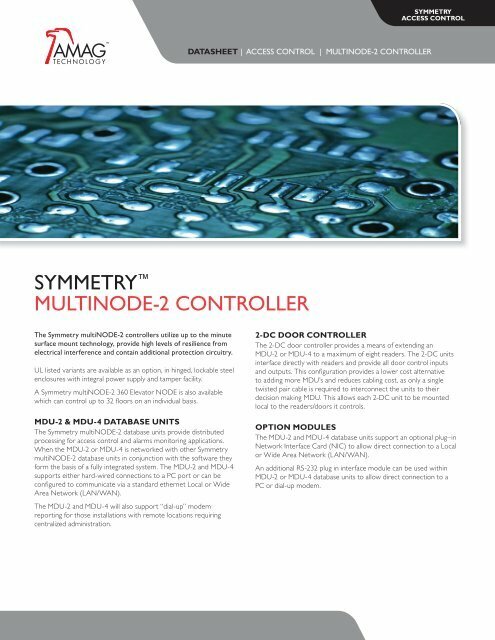 Symmetry multiNODE-2 will support morethan one reader type per controller.expansion capabilityThe MDU-2 fully supports direct connections for two readers withdoors, and is easily expanded to process an additional six readers/doors when connected via low-cost 2-DC Door Controllers.The MDU-4 fully supports direct connections for four readers withdoors and is easily expanded to process an additional four readers/doors when connected via the low cost 2-DC door controllers.Alarms monitoring optionAlarms monitoring and auxiliary output relays can be added tothe MDU-2 and MDU-4 by optional plug-in modules providingeight supervised inputs and 4 supervised outputs for every pair ofreaders. A fully confi gured eight reader Symmetry multiNODE-2 cantherefore support 32 supervised inputs and 16 supervised outputs.reader technologies & card formatsEach door controller supports a wide range of reader technologiesincluding standard and custom formats.Alarms monitoring optionAlarms monitoring and the control of auxiliary output relays arepossible from the 2-DC unit when the input/output plug-in optionmodule is added.communicationsEach 2-DC communicates with its decision-making MDU via atwisted pair RS-485 link. The confi guration can be cabled in eitherstar or multi-drop, dependent upon installation requirements. In theevent of a communications failure between an MDU and its DC, theDC can be further confi gured to verify on Customer Code only, orthe doors can be put into a permanent locked or unlocked state.power requirementsThe 2-DC requires an external 18VAC transformer. The 2-DC hasan integral 12VDC-power supply module and includes a batteryrecharge facility with space for a 7AH battery within the enclosure.communicationsTwo host communication ports are standard allowing SymmetrymultiNODE-2’s to be interconnected in a chain confi guration, via a20mA current loop. The fi rst Symmetry multiNODE-2 in a chain canuse the optional RS-232 plug-in module to directly connect with acomputer or dial-up modem or via an interface to the network.power requirementsBoth MDU-2 and MDU-4 require an external 18VAC transformer.The units have an integral 12VDC power supply module and includea battery recharge facility with space for a 7AH battery within theenclosure. access control | multinoDe-2 controllerDAtASheetSymmetryAcceSS controloption moDUleSSyStem ArchitectUrenetwork interface card (nic)The optional plug–in NIC is used to interface a chain of standardSymmetry multiNODE-2 database units to their PC via a LocalArea Network. The LAN chain is given a TCP/IP address andcommunicates with its assigned PC over the network linkproviding an alternative confi guration to direct connection viathe serial port. Only the fi rst NODE on a LAN chain requiresa NIC plug–in module. Subsequent controllers on the chain arestandard multiNODE–2 database units running on Version 2.8 orlater fi rmware. The NIC plug–in module is 12VDC powered fromits multiNODE–2 database unit enabling continued operationin the event of power failure. The NIC also incorporates anintegral RS-232 module to support the option of fallback dial-upcommunications, in the event of network failure, via an externalmodem. The fallback dial-up alarms reporting is automatic whena network failure is detected.RS232 OptionMDU-22 DC2 DC2 DCMDU-2MDU-2MDU-2rS-232 moduleWhen fi tted to a Symmetry multiNODE-2 database unit, thismodule converts the upstream communications port from thestandard 20mA current loop interface to RS-232 operation,enabling a Host computer to directly connect to the fi rstSymmetry multiNODE-2 in the chain, if within 50 feet (15meters). The module also allows direct connection to a dialupmodem in remote site applications, providing a lower costsolution than third party external interface boxes.RS232 OptionMDU-4input/output moduleThis plug–in board allows alarms monitoring and programmableoutput switching to be integrated into any controller. The moduleprovides eight monitor point inputs and four auxiliary relayoutputs for every pair of readers. A fully confi gured eight readerSymmetry multiNODE-2 can support 32 supervised inputs and16 supervised outputs. Monitor points can be programmed for2/3/4 state supervision, dependent upon requirements.MDU-42 DC2 DCMDU-4MDU-4power requirementsAll option boards plug directly into the appropriate controllerand obtain power from the main board.